Personal injury cases come in all shapes and sizes. If you’re just getting familiar with the term “personal injury”, then it’s good to understand what falls under that umbrella. 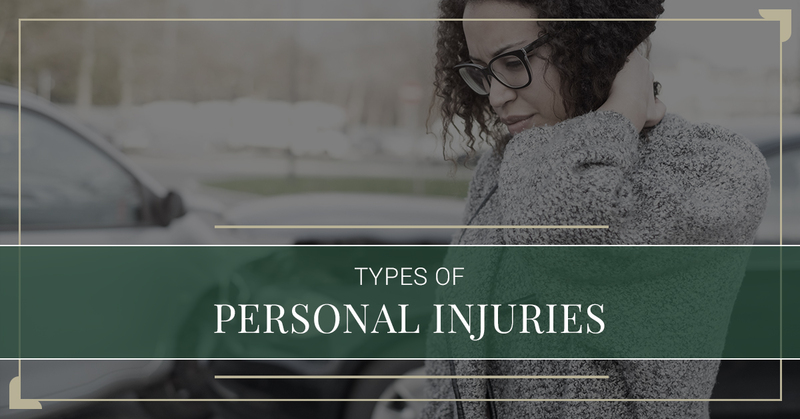 In today’s blog post we are going to touch on a few of the different types of personal injury and what all they include. One of the most common types of personal injury cases is your standard car accident. Of course, this is all going to depend on the conditions of the accident and how it all came to be. Usually, when an accident has happened, it’s because one or more drivers weren’t paying attention, abiding by the law, or driving safely. If you were injured in an accident where the driver that caused the incident was negligent, irresponsible, or wasn’t paying attention — then you have a personal injury case. These types of cases usually lead to the individual that caused the accident to be responsible for any of the expenses that were caused by the injury. This will be the case for most personal injury cases that are due to an accident, but as always, the circumstances will vary based on the countless factors of your accident and the case itself. The second most common type of personal injury cases are going to be the slip and falls that happen. Now, this may sound a little bit vague, but in all reality, they’re very straightforward. Personal injury cases that are due to a slip and fall will fall back on the owner of the property, so it could be anything from a place of work, a business, or a property rental, that wasn’t being responsible with the property that they own. As a property owner, it’s your responsibility to ensure that the property is free of hazards and safe for any of the people that are going to be occupying the space. If someone is injured because of any negligence of the property, the owner is then liable. Again, this is going to vary on a case to case basis, so it’s essential that you turn to a professional to assist you with the details. Having an injury occur that leads to medical care is not ideal, but the case can become even more serious when there is some type of medical malpractice that happens in that process. If a doctor or other form of medical professional follow through on an act of care where the patient ends up in a worse condition or is injured, then there is a medical malpractice case. Though these cases do happen every once in a while, they are pretty complicated and some of the more difficult ones to work through. The primary reason for that is that there are so many different types of evidence that will need to be accounted for. It’s crucial that your lawyer is able to not only acknowledge the pieces needed to build a strong case, but they are able to follow through. Another challenging form of personal injury to take on are the cases build around dog bites. These types of cases are challenging but will usually place responsibility on the owner of the dog. Every state is going to have different laws that affect the outcome of these personal injury cases, and the same can be said of the circumstances of the bite. These cases are serious and should be treated as so. Talk to a personal injury lawyer that can provide you with clear expectations of your case. Personal injury cases are difficult, and they vary on a case to case basis, so it’s definitely suggested that you turn to a lawyer that is familiar with this type of law to help you find the best solution moving forward. When it comes to personal injury cases in the Twin Cities area, there’s no one better than Woods & Thompson P.A. Our team can provide you with the guidance and assistance that you need to see the case through. Contact us today to schedule a consultation or for any questions that you may have.